The bees leave behind fire blight bacteria in the tubes. Fire blight is a serious threat to fruit trees. Now a quick test has been developed at the Vienna University of Technology, which can indicate the danger early - with the help of bees. When blossoms and leaves wilt and turn black, it is usually too late: the plant disease fire blight damages especially apple trees and pear trees, clearing the affected trees is often the only chance left. Within a single season, fire blight can destroy an entire orchard. However, researchers at the Vienna University of Technology together with the Austrian Agency for Health and Food Safety (AGES) have now developed a method to detect the disease very quickly. Bees visit many trees at the same time and so they bring the dangerous bacteria back to the hive, where a test station is located. A genetic test, tailor-made to detect fire blight DNA, then reveals if an imminent fire blight danger actually exists. Up till now, constantly monitoring a large orchard for fire blight has been practically impossible. This always involved manually collecting blossoms from all the trees and then examining them for the fire blight bacteria; and even then it could not be excluded that an affected branch had been overlooked. However, this arduous work can now be outsourced - to bee colonies that are already active around the blossoms anyway. "Nowadays, bees are specifically located in many orchards to ensure adequate pollination," explains Heidi Halbwirth from the Institute of Chemical Engineering, Environmental Technology and Technical Biosciences of the Technical University of Vienna. The fire blight bacteria stick to the bees, they take the bacteria back to the hive, contributing to the spread of the disease. "Back at the hive, we attach small tubes lined with foil at the hive entrance, through which every bee must crawl", says Halbwirth. "If the bees have come into contact with the bacteria, then some bacteria are left behind on the foil linings." 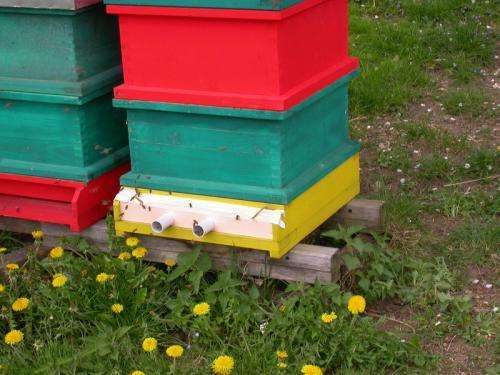 This bee monitoring method was developed in cooperation with the Austrian Agency for Health and Food Safety (AGES). 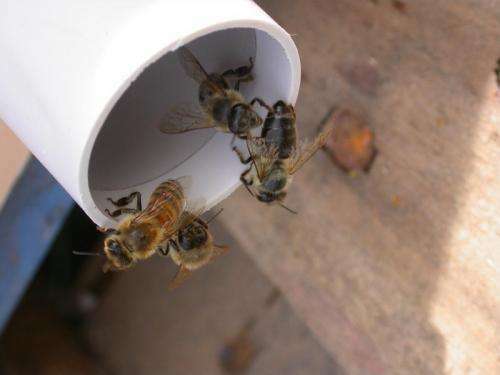 The hives can only be accessed through the tubes. Already after just a few hours, the films may be removed and any bacteria present can be washed off. The washing solution is then subjected to a specially developed colour test, called the Blue EaLAMP, which examines for possible fire blight bacteria. 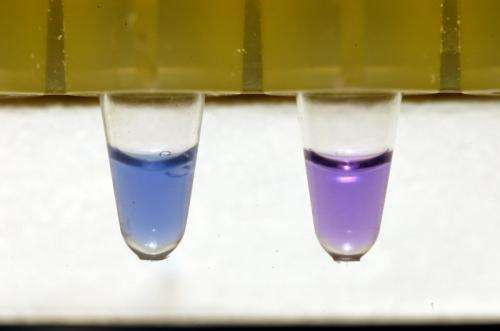 "The liquid of the Blue LAMP reacts very specifically to the presence of the fire blight bacteria DNA," says Christian Gosch, who developed this test together with Heidi Halbwirth, Karl Stich and Thilo Fischer: At a temperature of 63°C, the DNA is replicated on a massive scale by a biochemical chain reaction, and if any fire blight DNA is present the liquid will change its colour from purple to blue. The method is extremely sensitive and a presence of just 20 bacteria is sufficient to be detected. Up till now, one had to collect blossoms and send them off to a laboratory for testing. However, with this new test fruit growers and beekeepers alike can determine for themselves within just a few hours whether there is actually fire blight in the locality. Previously, as a preventive measure, antibiotics such as streptomycin were often sprayed in the orchards whenever a high fire blight risk was just suspected on the basis of the season and weather conditions. This quick test should now provide reliable information as to whether such measures are necessary at all, or whether the area is currently free of fire blight. The flight range of bees is up to three kilometres and that is large enough to enable the monitoring of ones own orchard and the surrounding areas which provide a direct threat. The Blue LAMP-test: fire blight DNA makes the colour switch. This quick test of the TU Vienna has already been patented and it is to be noted that it is not the first patent that has emerged from the research performed by Heidi Halbwirth, Christian Gosch, Thilo C. Fischer and Karl Stich. In recent years, they already developed environmentally friendly fire blight control agents that can be used instead of antibiotics.